In this article, we will be exploring the different methods available to get Windows 10 for free. We will share four unique options and explain whether each of these options is legal. Hopefully, after reading this article, you’ll be more clued up about how Windows 10 activation works and why Microsoft charges for it in the first place. You may have heard from a friend or colleague that they were able to download Windows 10 for free from a third party website, or maybe you read about it online. Your source of information may have mentioned that they can get you the full Windows 10 operating system for free, without any watermarks or product key. Using a third party website to download Windows 10 for free is certainly against Microsoft’s policies and more importantly, it may present some legal troubles or other issues for you. Downloading a full version of Windows 10 for free from a third party source is absolutely illegal and we wouldn’t recommend it. It’s up to debate whether or not downloading Microsoft software illegally will land you in trouble or with a big fine, but it’s certainly possible and Microsoft have the right to pursue legal action in this case. Perhaps more worryingly, downloading Windows 10 for free from third party websites can be very dangerous. Those that give away cracked software for free may tamper with the software and package it with malware or viruses. Some malware may track your key presses and steal your information, or they may use your PC power to mine cryptocurrency. Alternatively, they may run ads on your system in the background to earn money from you. If you desperately need to download Windows 10 for free and don’t have any installation media, you do not need to look for third party sources. Microsoft actually lets users download Windows 10 completely free directly from their own website. 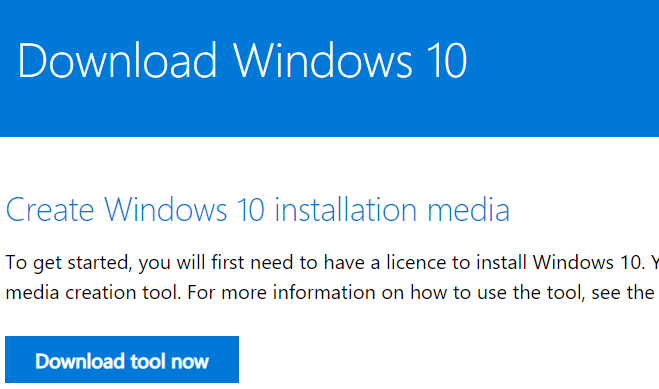 You can find the Windows 10 Download tool here. With this tool, you can create your own bootable Windows 10 installation USB drive or CD. Using this method is legal and is provided directly from Microsoft. With this method, you can install and run Windows 10 without a product activation key. It’s important to note that if you continue to use Windows without activating it with a purchased license, you will be going against Microsoft’s terms of service. It is recommended that you purchase a license to support Microsoft and ensure you are abiding by their terms of service. However, for a quick fix, this option is available to you if you need to get Windows 10 up and running on a machine quickly. Using this method is not dangerous because it is provided directly from Microsoft. There is no chance that this method would include viruses or malware. Just make sure you let the Windows 10 Download tool complete the process completely before installing it on a new system. If you are considering using Windows 10 Enterprise for your business, you’ll be happy to hear that you can evaluate it for free for a period of 90 days. Windows 10 Enterprise is a version of Windows 10 that is targeted toward medium to large businesses. It shares very similar functionality with Windows 10 Pro with some small adjustments. 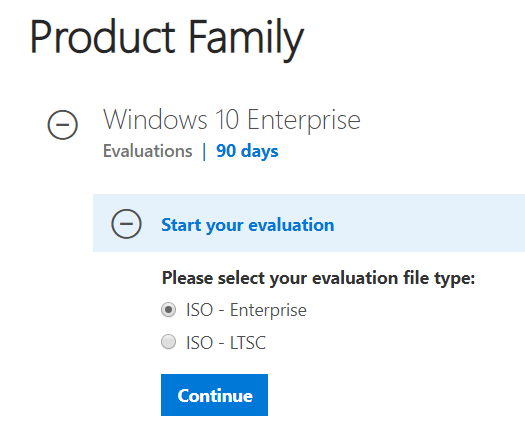 You can find the evaluation page for Windows 10 Enterprise here. It is completely legal to use this method to download Windows 10 Enterprise, but Microsoft have provided this option for those interested in purchasing a license from them after the initial evaluation stage. Technically, there are no rules that state you must purchase Windows 10 Enterprise after the 90 day evaluation is up, but you will be going against their terms if you continue to use the software after the evaluation period without purchasing a license first. Once again, this method isn’t dangerous because you’ll be going directly through Microsoft. Just keep in mind that you’ll need to create an ISO before installing the operating system, so this will require a bootable USB drive or a CD. If you purchased a Windows 10 installation disc in the past, it is possible to use it to install your copy of Windows 10 on another system. This is easily the most convenient option available because all you need to do is place the disc into the system you’d like to install Windows 10 on. When you purchase a Windows 10 installation disc, you are asked that you only install and use the software on one system. Doing otherwise is against Microsoft’s license terms. However, you can still stay within the boundaries of Microsoft’s terms if you contact them and ask to transfer your license from your existing system to this new system. Alternatively, if you are installing the Windows 10 disc onto the system you first activated the license on, you are well within your rights to reinstall it on the same system. Windows will check your hardware to determine whether it’s the same system or not. In some cases, if you change your hardware, the OS may assume it is a new system when it is in fact the same. You can contact Microsoft support to get assistance with this problem. This option bares no risk – in fact, it may be the safest option because you are using media directly from Microsoft and you don’t even need the internet for the entire process. Will Going Against Microsoft’s Terms Get Me in Trouble? With Microsoft offering so many free methods to install Windows 10, it is possible to install Windows 10 for free directly from them and never pay to activate it. If you choose to do this, you’ll still have access to updates and all of the operating system features will remain active to you. The only negatives will be that there will be a watermark at the bottom of your display at all times and you will not be able to access Office 365 programs like Word or PowerPoint. Some personalization options will also be disabled. Going this route will mean that you are going against Microsoft’s terms of service, but there’s very little Microsoft can do to stop you. If you are an individual, you are not going to run into any trouble. If you are a business that repairs or sells computers, you may then run into some legal troubles. Ultimately, Microsoft has become very lenient with unactivated users – they would prefer even those that use Windows 10 without a license to have full security protection and the latest updates to avoid malware and virus infections. So, in summary, the option is there to remain unlicensed, but it is still going against Microsoft’s licensing terms. It may be a payment you don’t want to make, but we’d recommend making the payment to support Microsoft. It takes a lot of money to hire employees to develop, maintain, and provide support for Windows 10. Enjoy!